American Sign Language, commonly used by people who are hard of hearing, is the primary sign language used in North America and the third most used language in the United States. The newly established ASL club aims to enlighten the Fountain Valley High School community about sign language and deaf culture. The club was founded by seniors President Brandon Nguyen and Vice President Peter Pham who wanted to create a space on campus for students to learn ASL. The two were exposed to ASL due to their personal experiences, and were eventually inspired to create the club after taking a summer ASL course offered at Golden West College. “We thought that maybe to bring more diversity in the language department to the school, we could introduce an entirely different language,” said Pham. FVHS currently offers Spanish, French and Japanese as world language electives. ASL is not part of the FVHS world language department, but students can contact Assistant Principal Nancy Peterson to enroll for ASL classes through off-site dual enrollment. Students who want to learn ASL in a casual environment are highly encouraged to join ASL club. “There’s ton of varieties of people out there who might be interested in sign language, but might not have had the courage to start their own club or have the time to invest into their studies. And I figured, what’s more convenient than coming in here for 20 to 30 minutes and learning some conventional phrases and speech,” Nguyen said. The club aims to provide greater education of the Deaf culture, which comprises about five percent of the world’s population, according to the World Health Organization. Every meeting acts as a step towards understanding their perspectives, and knowing how to communicate with them is crucial to the process. During meetings, Nguyen and Pham deliver this process by teaching and practicing ASL with students using the ASL curriculum from GWC. “We’ll be watching and practicing our sign, and learning phrases you can use to communicate with [deaf people],” Nguyen said. Fridays are dedicated to breaking down the complexities of ASL. Thirty percent of words in the language have to be spelled out because of the limitations of gestures and facial expressions. Yet, ASL doesn’t incorporate a written form; it’s purely visual. Rather than logistical and methodical, learning ASL is more of a creative and imaginative experience. 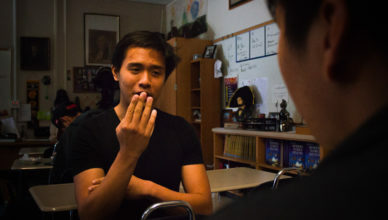 “American Sign Language isn’t like your typical language; it’s a visual art, you’re actually incorporating a different side of your brain,” Nguyen said. In addition to teaching ASL, the club offers members an opportunity every month to socialize with deaf individuals across Orange County. “The Irvine Spectrum, the Block at Orange; the huge shopping district provides such an incentive for [the deaf culture] to go over there… they will literally sign, order, eat–pretty nice, it’s an experience if you’ve never been there before,” Nguyen said. Language and events — the ASL club offers both for FVHS students, and a peek into a local culture of our own. Thank you for writing this, it was a nice read! It’s great that your school has an ASL club. Raising awareness about ASL is important!